How much time do you spend on your smartphone each day? Do you ever feel like your cell phone usage gets in the way of important tasks (i.e., work, social engagements, and addiction recovery)? Seeing as there is an excellent chance that you are reading this article on your smartphone, it stands to reason that you spend at least a fair amount of time gazing into the “black mirror.” While there isn’t anything inherently wrong with Apple iPhones or Google Androids, people can become problematically reliant on devices if they spend too much time tapping and swiping. It should go without saying that working a program of addiction recovery requires participation. Merely put, staying clean and sober demands your attention throughout the day. Just not drinking and drugging isn’t going to keep you on the straight and narrow; lasting recovery depends on actively engaging in the program to which you subscribe. When attending recovery meetings in the 21st Century, it has become commonplace to see several people staring at their phone. In some cases, there is a legitimate reason for pulling out a smartphone during a meeting, but, more times than not people are just trying to pass the time. A meeting is generally an hour in length; it is telling if one can’t manage without their phone for such an insignificant timespan. If you find it challenging to avoid looking at your phone during a meeting, please ask yourself, ‘what am I losing by not being present?’ Sure, some support gatherings are less stimulating than others; however, any time a person shares it takes tremendous courage which should be met with some deference. What’s more, a group member may share something that could prove useful to your recovery; if you are immersed in a cellular reality, you just might miss something valuable in the real world. 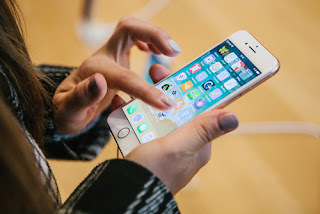 Cellphones are, in fact, useful tools that have the power to connect people; such devices offer several apps that can facilitate healthy behaviors; and, if problems arise that may jeopardize one’s program, picking up the phone may avert a relapse. There is plenty of time each day for scrolling through articles and seeing what your friends ate for lunch on Instagram. Taking a cellular hiatus for a couple waking hours can go a long way in helping you stay present. If you are new to the program, the more time you spend engaging with your peers in the physical realm, the better. Smartphones have not been around all that long, but there are indications that devices are having some unintended effects. Many people spend over six hours a day checking their phone for the latest news alert, scanning friends’ timelines, and playing games. In many cases, people are unaware of just how much time they spend on their phone. As a result, there is a push of late to curb or curtail smartphone usage by encouraging individuals to take a step back. It is possible that if you knew how much time you were on your phone each day that you might make some changes. How much time you’re spending on individual apps? How often you pick up your phone? Which apps send you the largest number of notifications? "There's clearly users out there that are worried about the amount of time they're spending, or the amount of distraction or interruptions that they get," Apple CEO Tim Cook tells NPR. "So we thought really deeply about this and, sort of our latest is what you call a "Screen Time." He adds, "Right now we can all almost kid ourselves a bit about how much time we're spending, and whether we're distracted or not. There's nothing like getting a report of facts to see what is happening to you." Equipped with the above information, this feature will allow iPhone users to set limits on their usage of specific apps, according to the article. Knowing how much time you are spending using an application will force you to consider if the behavior is healthy; you may decide that an hour in the news app is enough for one day, and then focus your energy on something else, like sharing in a meeting perhaps. Please contact Hope by the Sea if you or a loved one's life is unmanageable due to alcohol or drug use. Our team of skilled professionals can give you the tools to lead a life in addiction recovery.